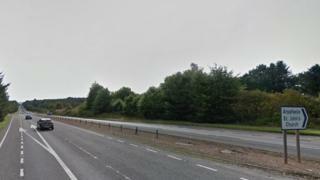 Two men have been charged after two vehicles were detected being driven at 131mph on the A9 trunk road in the Highlands. Police Scotland said road policing officers spotted the vehicles near Arpafeelie north of Inverness at about 23:15 on Wednesday. The men, aged 30 and 25-years-old, will be reported to the procurator fiscal. They are expected to appear at Inverness Sheriff Court at a later date. Insp Neil Lumsden said travelling at high speed could be have "catastrophic consequences". He said: "It is disappointing that drivers are willing to put themselves and others at such risk. "Convictions for road traffic offences like this can result in a fine, penalty points, disqualification or even imprisonment - and the consequences of any collision could be even more serious."